♿I was born with a disease that put me in a wheelchair. Being a wheelchair user is hard to go about losing weight because we are limited, meaning, it is harder for us to get some type of physical exercise in depending on your condition. Physical exercise is one of the requirements in order to lose weight. Personally, depending on your situation, that should not be an excuse to be overweight or underweight; You must be disciplined and committed if you are serious about losing weight and staying lean! During my childhood, I was kinda fat, I'd say. Everyone was grabbing my cheeks, just like you see it everywhere with babies (and kids with chubby cheeks 😋), I wasn't annoyed by it at all until I realized I am [overweight]. I saw that I had a fat pack under my chin/my neck area, my stomach was bulged out, and I knew my body was not liking it. I did not care about Nutrition nor my looks when I was a child, (You should not anyways, have fun, enjoy the childhood ) but when I reached middle school, I wanted to look better for myself and for the girls (😅). So I began to examine what made me fat and how could I go about it to make sure this does not happen again. I started to research about nutrition, I wanted to know the basics of the understanding of how you gain fat [weight], and how to lose fat & to stay lean/toned. I became overweight due to simple things; Diet/Nutrition & Lack of Exercise. Diet, nutrition, and exercise were not in my favor. In fact, I hated to exercise, I did not want to move. Since I was wheelchair user since day #1, I did not think of anything really when it came to my health. I did not care about improving my strength, being active and eating healthy. Yet I enjoyed life. As time went on, I gained weight that was unpleasing to me. I noticed it was my eating ways. People were feeding me whatever; I was eating whatever that tasted good, but that came with a consequence. For example; I would eat a lot of frozen burritos, drinking sodas throughout the day, munching on chips, and donuts, and the worst part I was immobile (inactive - no exercise) - playing video games 95% of the time. I was not giving my body what it needs; it needs attention. I soon realized this and changed my ways.. Better Nutrition is a must for all - for everyone. Everyone seems to not focus on nutrition as much as the exercise part; if your diet is off but your workout is on-point, you are not going to see good results due to your diet - you must efficiently eat in order to benefit/nourish your body. Junk nutrients do not provide the body well with recovery, etc, that is why people are always having health issues. Reduce health issues such as inflammation, stabled blood-sugar, etc. Exercising, on the other hand, is a must as well. Being INACTIVE for a long period of time will cause huge damage to your body. It is a huge issue amongst wheelchair people, the elderly, and those who do not like to engage in some type of physical exercise. You do not need to [exercise] necessarily in order to LOSE weight but being inactive for sure will cause a problem and we want to prevent that in order to make sure that your body is functioning and feeling good properly. You do not need to follow a bodybuilding routine in order to get some physical exercise in, simple exercises/tasks will do the trick. Simple things such as yoga. Yoga is fantastic, it gets your body working, your muscles are engaged and functioning, your heart is working and you are benefiting the body by working it; the body needs to be maintained. Although, if you are overweight, I do not think yoga will do the trick for ya. Overweight people need some INTENSE physical exercise in order to promote a fat-burning process - Once you are in that state of heart-racing, sweating and working harder than ever, you are going to burn fat in the process. Yoga is not really an intensive workout routine. Below, I'm going to share with you people my tips on how to lose your weight & how to stay lean. 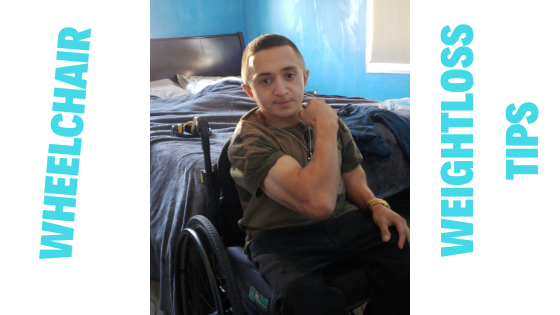 - Remember, I'm committed to my diet-lifestyle; I'm strict on myself and on my choices - The choices and tips I provide will benefit you in the long run - Being in a wheelchair does not stop you from being toned or lean, and it certainly does not give you an excuse to be overweight or underweight. Depending on your situation, try to find a way to workout. As hard as it is or could be, you have to. Be creative in your workouts. Use things that will assist you, like a resistance band, a rope, etc. Get your heart racing - That is the Goal. Track your calories - In order to lose fat - You must be in a calorie deficit! Calorie deficit will make you drop fat because you are consuming fewer calories than usual/normal therefore your body is going to use resources in order to provide you, your body, energy to operate. Your body will adapt over time, so remember, manipulation of macros is the key to go about losing fat! - On your mobile app, Search in your app store "MyfitnessPal" to begin tracking your calories! Eat healthier [ALL THE TIME]. It is hard, but not really. If you REALLY want to lose weight and STAY LEAN, you must be committed to a healthy lifestyle. You must be aware of your nutrition intake. This is a plus because it promotes a better mind and body. You will look better, feel better, perform way better and you will be lean and toned without question! Stay hydrated - I cannot stress this enough - Staying hydrated has MANY positive Benefits that everyone must look into! Appetite Suppressants: I use coffee for its effects to help curb my appetite at times, usually when I'm fasting - Everyday in the morning til' the afternoon. There are other ways to help curb your appetite other than coffee. Not caring about Nutrition or Diet - Nutrition is the most important part because it involves your diet - if you are eating junk, your body will essentially look like junk. Also, indulging in foods will lead to weight gain. Be smart about your food selections and do not over-eat. *Excessive Eating is a No-NO! No Activity: As I mentioned earlier, you need activity. Being inactive has its downsides, huge downsides to be honest. Little activity is better than none. Get to work! Try to exercise at least 2-3x a week! intense days are required. Try out new Food [Seletions]. If you are only eating pasta, rice, beans or the same frequent meals; perhaps that's causing some issues - mix it up, make sure you have veggies, nuts and fruits within your diet to nourish your body! I mentioned this earlier, I'm on a diet year-round, it became a lifestyle, so I'm technically not on a diet. But there are other diets I've tried out to manipulate my body. Are you using a manual or powered wheelchair? - I recommend everyone who can use their arms to use a manual wheelchair because it requires physical exercise. Using a powered wheelchair completely removes any type of physical exercise which leads to problems. I have been in a wheelchair since I was a little boy. I went through troubles of weight gain, I went through troubles of trying to lose weight, how to lose weight, how to stay motivated, how or is it possible? I was determined and focused to lose weight and to stay lean & toned, that is my goal. I adopted a good dieting lifestyle which helped me reach my goal much faster. You should not have an excuse to not lose weight; it is harder I have to admit, but still that is no excuse. Try anything in your power to lose that weight, to become better and healthier. That should be the goal for everyone. ◉ Need Coaching? I'm Available!